One of the most beautiful songs to ever grace White Hart Lane, or indeed, Wembley, is Glory Glory Tottenham Hotspur. However, this song was certainly not invented by the North London Club. This song was originally based on the American Civil War Song “The Battle Hymn of the Republic”. The Battle Hymn was published on the front page of the Atlantic monthly of February 1862. Anti-Slavery activist Julia Ward Howe received just $4 for this poem. However, the roots of this tune goes a little deeper. The tune of “Glory Hallelujah” or “Say, Brothers, Will You Meet Us” was actually composed by William Steffe in 1856, which Howe then adapted. Going back to Howe’s poem, it focuses on the glory of the coming of the lord. It is very much a martial poem with fiery language of “grapes of wrath”, “fateful lightning” and “terrible swift sword”. The most recognisable verse is of course “glory glory hallelujah…His truth is marching on”. Today’s version of the song is edited down to that little section of Howe’s poem. And of course, it carries far less religious overtones. Nevertheless, the idea of glory is still present. Glory in the coming of the Lord, versus that glory of an illustrious football team winning trophies. It perhaps isn’t really a fair translation of Howe’s glory, with these meanings clearly on either end of the material, immaterial spectrum. Spurs first used this song when they essentially stopped Wolves from winning the double in 1960, after they had already lifted the FA Cup. A song in jest. Since then, many other clubs have gone on to adopt this song. This includes Leeds United and Manchester United. But it also includes Hibernian who were the first to record an official club version. These are the most famous clubs to utilise this age old song. However, more often it is a song appropriated to new clubs. The song itself is rather adaptable and can easily fit abbreviations or full names of clubs. This is the ramshackle nature of football songs that can squeeze syllables in here and there to make a song work. Take the example of the Yaya/Kolo Toure song and how Spurs fans adapted it to fit Toby Alderweireld and Jan Vertonghen’s names in there. For each club this song will have its very own identity. Where it was first sung, the winning titles behind it, the glorious moments will all help to shape this. It is indicative of a club’s rich history in titles and silverware. For a club such as Tottenham, there is a great sense of irony when fans sing this song. They hark back to the former “glory glory” days of the club, during this now barren period. In this way, there is a sense of hope, anticipation and expectation that these days will soon be restored. In comparison, for a club such as Manchester United, fans do not have to look back so far to find the glory. In this way, their appropriation of the song seems to overshadow that of Tottenham’s. Their more global fan base, adopting this seemingly traditional song, almost makes a history of their own with Howe’s original poem. 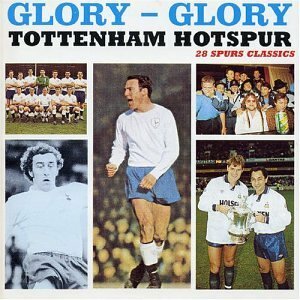 But, there is no disputing the fact that Tottenham were the first club to notably have sung the song. Now, Spurs fans just want to be able to sing the song in celebration of a new title, rather than dusting off the cobwebs of yesteryear.